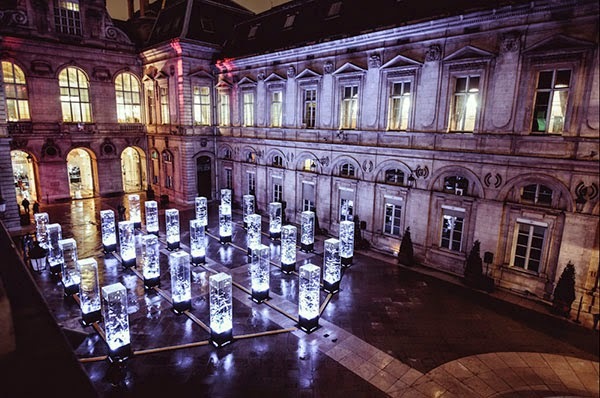 An installation at the city hall courtyard in Lyon which consists of 26 plexiglass monoliths containing LEDs, an immersive soundtrack, and feathers. The installation, part of the annual Fête des Lumières (Festival of Lights), synchronizes sound, light, and feathers to create a fascinating aerial ballet. Njörd is a reference to the scandinavian god of wind, and also refers to the refined contemporary Nordic design. The installation draws up a mysterious landscape between mythologic scenery and modern space design. Wecomeinpeace is a visual and interactive design agency based in Lyon, France.